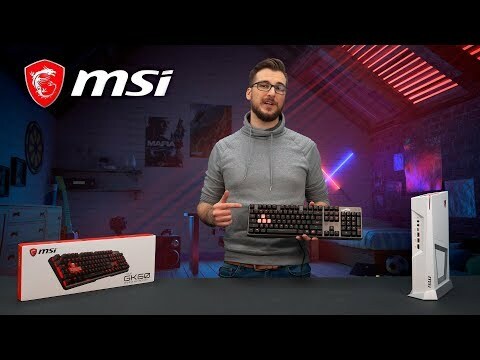 A SOLID BASE FOR GAMING The Vigor GK60 is the next addition in high-end gaming keyboards from MSI, providing you with the solid base you need for victory in gaming. It features four resilient metal keycaps on your WASD keys to give you complete endurance while gaming, and premium Cherry MX switches for extra durability and accurate feedback. A premium anodized aluminium frame surrounds the keyboard, and the keys feature 100% anti-ghosting with intuitive N-Key rollover technology so you’ll always be at the top of your game and never miss a keystroke. This high-calibre gaming keyboard comes with intense red backlighting and can be customized with 7 different lighting effects to truly immerse you into your gameplay. ERGONOMIC METAL KEYCAPS BUILT FOR GAMERS The Vigor GK60 comes with four luxury metal keycaps that allow you to game with more accuracy, providing amazing feedback and less chance to press mistakenly during those crucial gaming moments. Regular keycaps are included and are suitable for office use. DISCOVER AN INTENSE RED AESTHETIC The Vigor GK60 features classic red backlighting and includes 7 different lighting effects. You can also synchronize all your LED compatible gaming gear using MSI Mystic Light software, and customize detailed settings with MSI’s Gaming Center to truly personalize your keyboard to suit your style. *Vigor GK60 does not support RGB as it has single colour LED backlighting. SIMPLY ADJUST EFFECTS STRAIGHT FROM YOUR KEYBOARD With the dedicated hotkeys on the Vigor GK60 you can change the lighting effects on your keyboard with ease, with the ability to adjust effects such as speed, direction, fading, shadows and access to the different lighting modes. You can experiment with over 100 different effect combinations to suit the way you play. ANTI-GHOSTING & N-KEY ROLLOVER TECHNOLOGY Your movements will never get lost with the Vigor GK60, which comes with 100% anti-ghosting and N-Key Rollover technology (gaming mode). This enables you to press as many keys needed without them getting missed in the action, and to ensure you’ll always dominate the battlefield. The Vigor GK60 also comes with Windows key lock so your gaming will never be interrupted. PREMIUM ANODIZED ALUMINIUM FRAME Along with its intense aesthetics and amazing features, the Vigor GK60 is built with an impressively lightweight, durable aluminium anodized brushed frame that is made with only premium materials, delivering to you a solid base that will let you enjoy gaming for many years to come. CLASSIC AND UNSURPASSABLE COMFORT Cherry MX Red switches are one of the most popular and durable mechanical keyboard switches, which deliver amazing feedback and a comfortable typing experience withstanding over 50 million life cycles. GAME LONGER WITH THE EXCLUSIVE GAMING BASE The exclusive Gaming Base on the Vigor GK60 is located right under the space bar on the bottom of the keyboard and provides up to 25% better anti-slip performance and incredible typing feedback for long gaming sessions. SMART CABLE MANAGEMENT A dedicated space and the clever design of the Vigor GK60 allows you to run cables for your gaming gear underneath the keyboard to reduce cable clutter and to stop them from getting in the way during important tasks.